Everyday Tuesday, this space will feature a Quiz question. This is a new feature, like Sunday Reads, Saturday Infographic and The Explainer. We start with this question on Connect! Post your answers in the comments space. Answers on FB page will not be considered. The answer to this question will be published on Wednesday between 9 pm and 10 pm. The brand definitely is Apple. Bob Dylan is the other guy, unable to identify who is the third guy. But they were all part of the video clip of the Think Different ad campaign by apple. They were short clippings of all these people in the video. 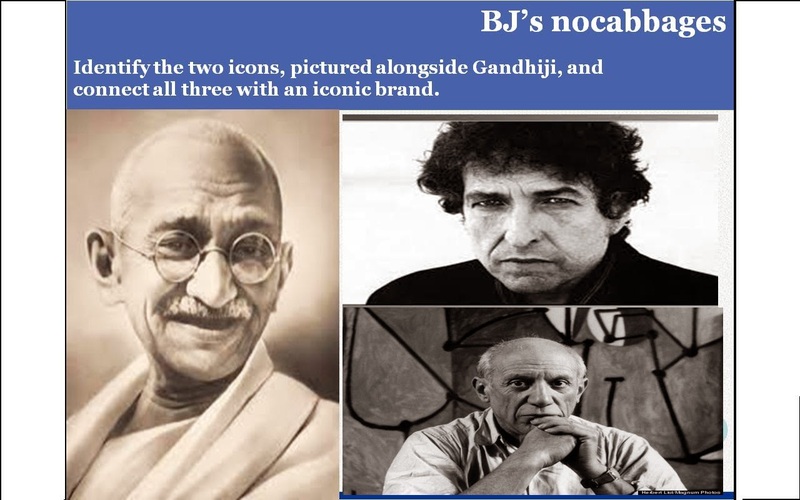 Mahatma Gandhi, Bob Dylan, Picasso. All three featured in Think different commercial of Apple. This connect picture features three of the several icons featured in Apple's 1997 Think Different ad campaign. Congratulations to Abhishek Badiyala, Tejkiran, Bharath Kumar and Sujana Sooreddy for the right answer. Sunday Reads with Saturday Infographic!